All the best players in the world use the bounce of the club to their benefit when hitting out of the sand. If you don’t use the bounce, it will lead to inconsistent shots - such as thin and chunk shots. Before we go to hit these high bunker shots, there are a couple of things we need to do from a setup perspective. The first is that we need to have the ball slightly forward in our stance (i.e. closer to the left foot for right handed golfer) and our weight evenly balanced (i.e. 50% right leg, 50% left leg). Secondly, in order to hit these high bunker shots, we must open up the face until the entire back of the club is facing the sand. As to whether you should stand open your stance to the pin - this depends on your personal preference. For me, I like to aim just the slightest bit open to the target, maybe two-to-three yards open to the left. Some people like to aim square to the target, and that’s fine as well. The one thing that I do see with some of my students is that when I ask them to open up the face, they feel it is pointing too much to the right. I would like to emphasize that there is a difference between where the face is pointing and where the loft of the club is pointing. When I was fifteen, my Irish National Team coach introduced me to a tool called a magnet stick, which you place on the club face, and it will then tell you where the loft of the club is pointing. This gave me a whole new understanding of where the loft of the club was pointing in my setup. So as you can see in the picture above, the face is wide open, but the loft of the face is pointing somewhat in the general direction of the pin. The lower I get my hands at setup, the more the loft of the face is going to point to the left. 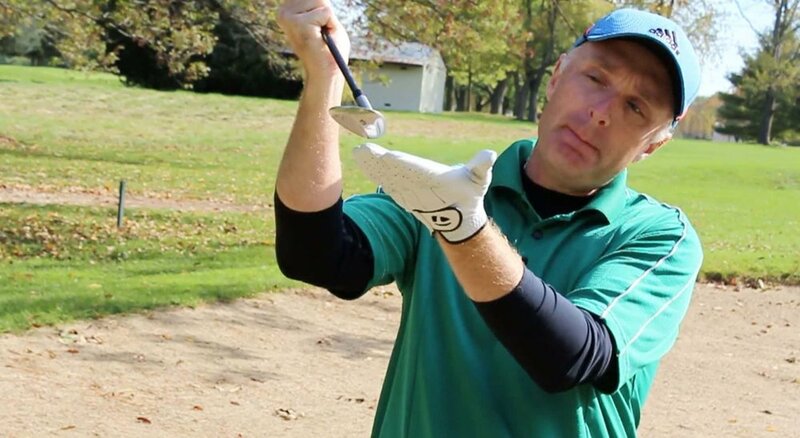 Now that we have given you some good fundamentals, there are a couple of other things I would like to add to help you hit a bunker shot with some height. On your backswing, I would actually like you to rotate the face open a little. This is going expose the bounce even more and add a little extra loft to the club. At impact, I want you to feel that the club head and handle are exactly aligned, almost in a straight line. I don't want to see the hands leading the club head at impact; or you trying to “scoop” and help the ball out of the bunker. I want you to feel that the club head and handle are lined up at impact. If you’d like something as a reminder when you go to driving range or golf course to hit a bunker shot high then download the bonus below. You'll receive a free step-by-step checklist that shows you the exact step-by-step process to hitting a bunker shot high.